In today's technically knowledgeable world, almost everything is performed on mobile phones. The more the users of mobile phones, the demand for mobile apps is also increasing at a large scale. The increased demand for mobile apps has boosted the number of app development companies in the market. There are many companies that are there to develop mobile apps and add great features. It is seen that the features in-app are absolutely different from the other, thus increases the customer interest in downloading the app. An app development company must be aware of the customer rising needs and work their best to develop an interesting app for the users that is also easy to use and compatible on different mobile devices. Selecting one of the best app development companies OmSoftware to develop a great app that also best fits your organizational needs is a very hard job. All the app development companies promise to offer great and unique features that make it even more difficult to decide what to choose? The task can become less troublesome if you decide what your needs are and how important they are? It is important to look for a team of developers that can understand your business needs and also take less time in developing the best suitable app for your business. The team should be active and willing to work with you and take your business's project as a challenge. Your selection should be good otherwise you will end up wasting your time, money and energy. 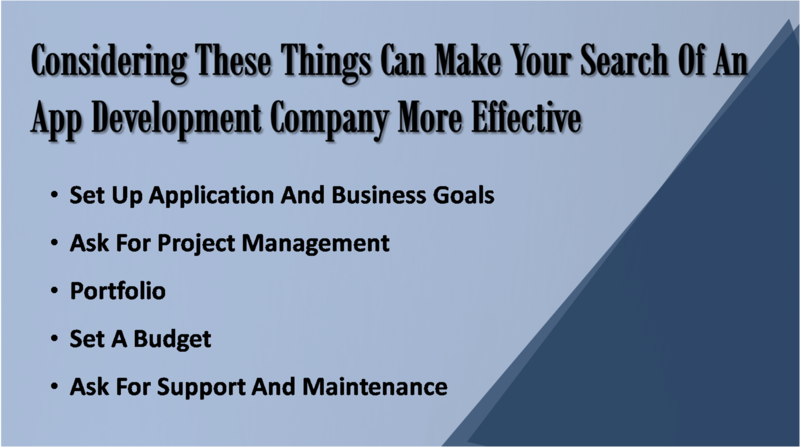 Considering These Things Can Make Your Search Of An App Development Company More Effective. • Set up application and business goals: Before start surveying the market for finding a good and reliable app development company, it is crucial to complete your own application needs. • Ask for project management: Most of the time companies outsource the services to other companies. It is good to ask for project management, who is the company to whom the app development is outsourced, their reputation etc. • Portfolio: Looking at the company's portfolio will give you an idea, that what is the project type that the company has already developed. You can easily decide on the company, if any of the already worked projects are one of your kinds. If not, you can ask directly by the company about your queries. • Set a budget: The idea of an app is huge and you can spend indefinite amount of money on an app. It is important to analyse your requirements and its related budget. • Ask for support and maintenance: The Company you selected should offer their support after the development. This helps you in moving further without any difficulty.